Behind the scenes: Tamas Weidner (second from right) and team are ready for winter. 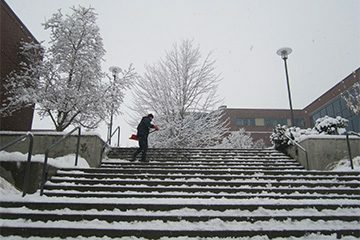 If the approach of winter weather has you cringing at the thought of hours spent shovelling heavy snow off your walkway and scraping ice off your windshield, spare a thought for the Building Operations and Facilities Management staff at UBC. While you may only now be thinking about pulling your snow shovel out of storage, these staff have been planning for weeks for any winter weather event that may strike the campuses. Having roads and sidewalks cleared, as well as maintaining open pathways to buildings, doesn’t just keep the university running—it also ensures the safety of faculty, staff, students, and visitors. On the Vancouver campus, preparations for this year’s winter have been underway for a while, with the Building Operations group getting their vehicles equipped for whatever Mother Nature may decide to throw at them. 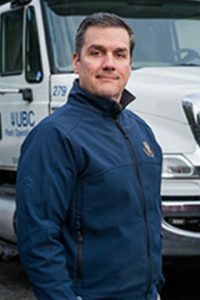 “In October, we sat down and said, ‘Okay, winter is coming,’” says Tamas Weidner, former Manager of the Building Operations Labour Division, who is now responsible for Waste Management and the Garage. A university fleet of six ATVs (all-terrain vehicles) get outfitted with plows and salters, while another two get equipped with briners that spray a mixture of water and salt. Even the ride-on mowers get armed with plows to enable them to clear sidewalks. The roads and pathways on campus are cleared according to a priority map that ensures important thoroughfares are maintained, and that buildings requiring wheelchair accessibility are clear of obstructions. That map is publicly available on the Building Operations website so that faculty, staff, students, and visitors can plan ahead. Having roads and sidewalks cleared, and maintaining open pathways to buildings, keeps the university running and ensures everyone’s safety. Despite the challenges of that year, says Tamas, some good came of it. “We learned a lot from that winter. 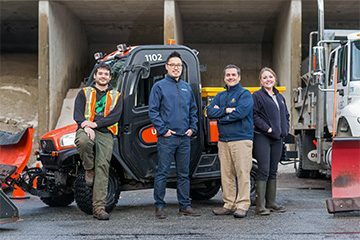 We made some changes to how we allocate sidewalks and roads, and the hand-clearing for accessibility, and we noticed huge changes.” While all of the snow and ice removal used to be managed by the Building Operations Labour Division, it is now a coordinated approach across the Municipal Services branch. The labour group takes on the roads and the handwork of clearing of building pathways and accessibility routes on the south side of campus, while the landscape group takes the sidewalks and the handwork on the north side. With the crews pulling long days that often start at 5am, both Tamas and Derek agree that notes of appreciation from university colleagues are a great morale-booster. 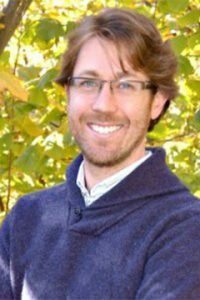 “We always post those notes in our shop so the crews can see it, or we read out the emails during meetings: ‘Hey, someone from the math department said thanks for doing a great job.’ That goes a huge way,” says Tamas.